One of the key assignments from the second EcoMaterials conference three years ago was to investigate and document the technologies and materials to cover earth walls. This is an art known by thousands of bricklayers masons around the world, but almost unknown by thescientific technicians, evidenced by a completel complete lack of scientific information on this theme. Lecturers and students in Guatemala and Ecuador are presenting the first results about their investigation of this theme. Add science to the empirical knowledge is the motto, and EcoSouth has reported various times about this work. The group from the university of San Carlos in Guatemala , led by lecturers Javier Quiñonez and Virgillio Ayala, is presenting clear results. The surprise is that the first practical application is being done in a national health program. In Guatemala , as other countries of the region, the Mal de Chagas is a serious illness which affects tens of thousands of people who then suffer a premature death. In 1909, the Brazilian doctor Carlos Chagas  specialist in infectious diseases  discovered that the  vinchuca  transports a unicellular parasite to which he gave the name Tripanosoma Cruzi. The genius of Chagas allowed him to make a triple discovery based on that information: (a) a disease, (b) its causal agent and (c) its transmitter. It might be the only case in medical history in which a researcher achieved this triple satisfaction and honor. An effective form of fighting the illness is to eliminate the habitat of the insects (vinchuca), which transmit the disease on to the people. The vinchuca breeds in cracks and small holes in ceilings and walls of houses. A coating or good plaster is an efficient means of controlling it. 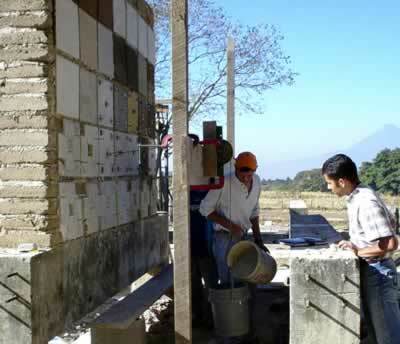 A group of students at San Carlos are giving practical and theoretical co p urses to the health promoters about how to coat the adobe houses so abundant in Guatemala . 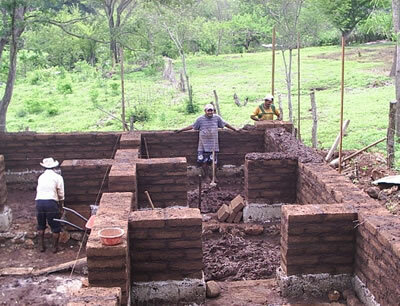 Omar Medrano, who recently presented his graduate thesis on the theme of relations between the chemical, mineralogical and mechanical bond of floors plasters used in earth walls coatings, explains that there is enough evidence that an earth plaster is the ideal form to coat adobe walls. The only thing for which we don't have evidence is the chemical and mineralogical composition of the ideal plaster. A new series of tests, for which there is national financing, has started now research this theme. 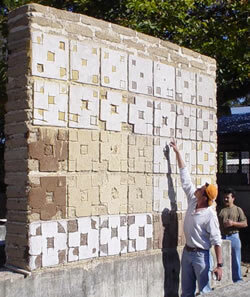 After the first two stages of investigation, where more than 80 recipes of bricklayers masons and c onstructors builders where analysed in detail, we can summarize, that adding lime to the earth and sand plaster strengthens it and at most above everything, it makes it resistant against humidity. Lime can be used directly in the plaster or in a more economic fashion it can be applied as a fine layer mixed with sand on top of the earth plaster. It also has been discovered that earth with puzolanic characteristics (abundant in volcanic zones) results in a better performance, especially when combined with lime. The use of Portland cement in this plaster is contradictory. While such a layer should be resistant to the effects of rain, the layers often fall down when applied in large areas. This results from a combination of different factors, which range from the different modules of expansion because of humidity changes, to and divergant divergent electronic charges between Portland cement and lime.